This entry was posted in Uncategorized on March 20, 2017 by Author Margaret McBride. What is the truth, anyway? Your truth, my truth? The truth is…not the same for everyone, is it? Nope. Truth –noun; is most often used to mean being in accord with fact or reality. Truth may also often be used in modern contexts to refer to an idea of “truth to self,” or authenticity. “I was born a poor white child; there are actually quite a few of us – heck, growing up, just in my family alone, there were nine (9) poor, white children. I wasn’t responsible for what my mother and father did, I was just one of the nine and we learned “the truth” very early in Life. My truth was: There is a God – His name is GOD, and He created Heaven & Hell. There’s no place like Heaven and this is where you want to go after you die. You do not want to go to Hell. My truth was: God has a Son – His name is Jesus. My truth was: Jesus loves all the children in the world – Red, Yellow, Black and White. My truth was: If you love Jesus back, you will definitely go to Heaven when you die (that was a no-brainer even to a 5yr old). My truth was: The Ten Commandments – YOU shall have no other gods before Me. YOU shall not make idols. You shall not take the name of the Lord your God in vain. You shall remember the Sabbath day, to keep it holy. You shall honor your father and mother. You shall not murder. You shall not commit adultery. You shall not steal. You will not bear false witness against your neighbor. You shall not covet. My truth was: You’re in church on Sunday morning (unless you have something serious, like measles, mumps, typhoid, two broken legs, in the hospital or dying). Church is where you go to learn about Jesus. My truth was: Once I knew Jesus, I would never be the same. My truth IS: That’s the truth!! …. 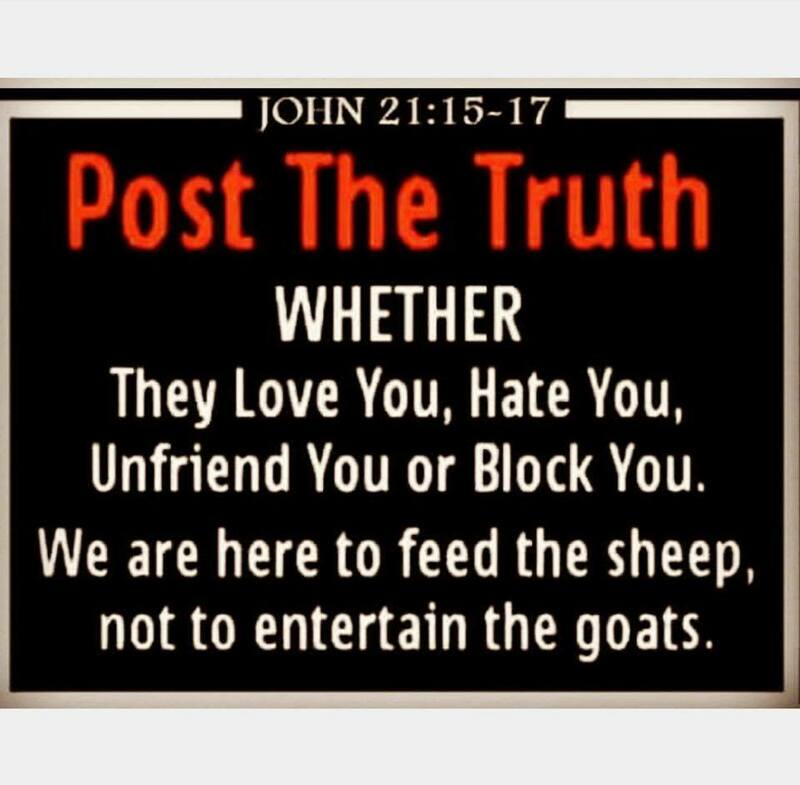 and I’m here to feed the sheep, not entertain the goats! My prayer for all of us this week, is that we’ll reach deep down into the hearts of our very souls – and ask ourselves if how we live our gift of Life reflects our truth? Amen. This entry was posted in Uncategorized on March 13, 2017 by Author Margaret McBride. It’s been quite a week and I’m excited to be back here with you this morning! I’m proud to announce I made a few new friends last week and to the best of my knowledge, made NO enemies—YAY ME! As a child growing up in the South, if I thought I had an enemy, that would have broken my little heart. I was always drawn to the “black sheep”…you know—the shy kids, the wall-flowers, the ones with holes in their socks, the kids who lived on the wrong side of the tracks…the kids who had no friends. I actually remember one sad family with six kids and the kids didn’t even like each other! That was really sad. It was probably something ingrained in me very early on by my darling Mother…”if you’re honest and always do your best, no matter what it is, you’re not any better than anyone else and no one else is any better than you.” She taught my siblings and me (all nine of us) that money was necessary for many things, but it couldn’t buy respect, honor or God’s approval— and you certainly couldn’t buy your way into Heaven! NOPE!! She also told me another very important fact: “in heaven you can have all the Bazooka Bubble Gum you want.” I simply loved that stuff and I drove her crazy with constant questions about what we could and could not have when we get to heaven. Poor Mother! Just think, she had not one, but nine—I, alone, was enough to make her want to run away from home— Oh brother—Thank goodness she didn’t!! I have such fond memories of Mother and my siblings growing up and although we were faced with some incredible obstacles, I’m reminded of the “rise from the ashes of the Phoenix”. Now that may sound a little extreme, but hey, this is my memory, right? Frankly, my memories not only light the corners of my mind, but also bring tears of both joy and sadness to my eyes, but ultimately joy to my heart. When we reflect on the trials and hardships we’ve endured, it’s not too hard to relive the pain and sorrow that may still be attached to it; however, when we’re able to move away and detach from that pain, we’re on our way to new beginnings…that’s called, YOU MADE IT, KIDDO!! I believe I was afflicted with the same “curse or blessing”(?) as my Mother. I watched her try to change my father for many years and she loved the Lord so much she believed that she was supposed to do whatever it took, as she was simply honoring her Faith and was bound and determined to be there for my father regardless of the consequences—and believe me, there were painful consequences—for everyone. After writing my book, That Melvin Bray, and reliving that sick and sad relationship my Mother had with my father, as we kids stood by and watched, suffered and endured, I was finally able to release the guilt I was holding in my heart about all that insanity. Guilt, You ask? Right…I had no reason to be harboring guilt —What had I ever done, or my siblings, to feel guilty about—NOTHING! Simply put, we were just there—innocent bystanders, collateral damage. Life in the hard lane…it happens —even in the “best” of families. Fast forward to the here and now, the present: My dear Mother not only taught me what to do, she also taught me what not to do. Most importantly, she taught me about JESUS and Heaven. She taught about PRAYER. She taught me about LOVE. She taught me about FORGIVENESS (and this was the hardest lesson I ever had to learn). Thank you, Mother! My book, That Melvin Bray, is a story about my Mother, my father and most importantly, Forgiveness. My prayer for all of us this week, is that we will embrace our memories and allow them to come in and light the corners of ours minds and hearts—that we will allow ourselves to feel the pain, but most importantly, embrace the Joy—It’s a lifesaver, believe me. God is Good! Good is Great!! Always!!! Note: Lifesaver, noun; a person or thing that saves a person, as from a difficult situation or critical moment. Jesus, Son of God; lifesaver, saver of souls, can’t get to heaven without Him. This entry was posted in Uncategorized on March 6, 2017 by Author Margaret McBride.